You wouldn't know it now, because my high school education is but a vague memory, but in high school, math was one of my favorite subjects, and something I really excelled at. I disliked Geometry, but I loved Algebra, and loved Advanced Math even more, so when it came time to decide between Calculus or beginner's Spanish my Senior year, Calculus was the clear winner. In spite of my teacher telling me almost daily what an airhead I was in her nasal, southern twang, I worked hard to become the best in the class. The longer and more complicated the equation, the more excited I was to figure out the answer. The teacher even took our class to one of those math contests once, and we watched in awe at the speed the contestants answered the questions. Yes, I was quite a math nerd, which may be why I so love watching The Big Bang Theory. 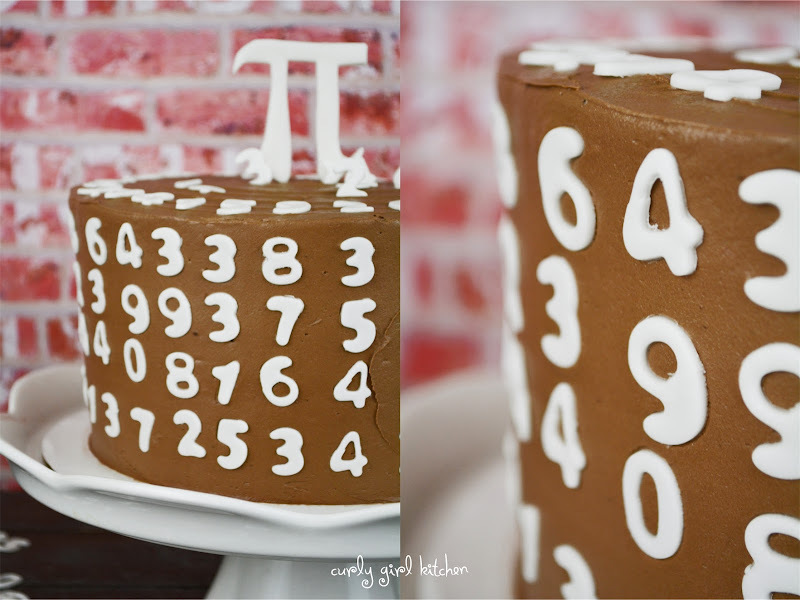 Jamie asked me if I had any ideas for something he could bring to work today because they were celebrating Pi Day at his office. I thought about it for a while and said, "How about a cake covered in the numbers of Pi? ", followed with, "What is Pi anyway? I can't remember." Oh, the shame. 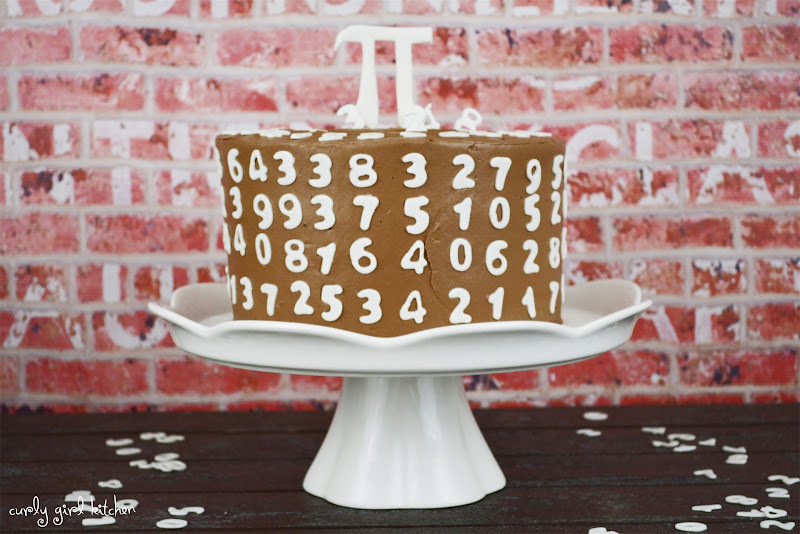 I shaped the Pi symbol freestyle out of fondant, cutting and molding it until it looked right, and attached it to two skewers to insert it into the cake. Then I spent half the evening on Wednesday cutting out tiny fondant numbers. 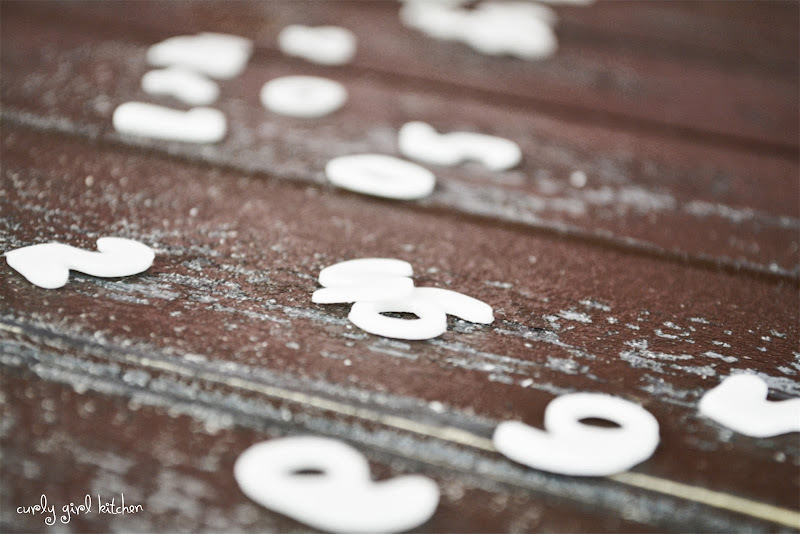 I filled a baking sheet with numbers, sorted in their correct order, until my fingers couldn't take any more. 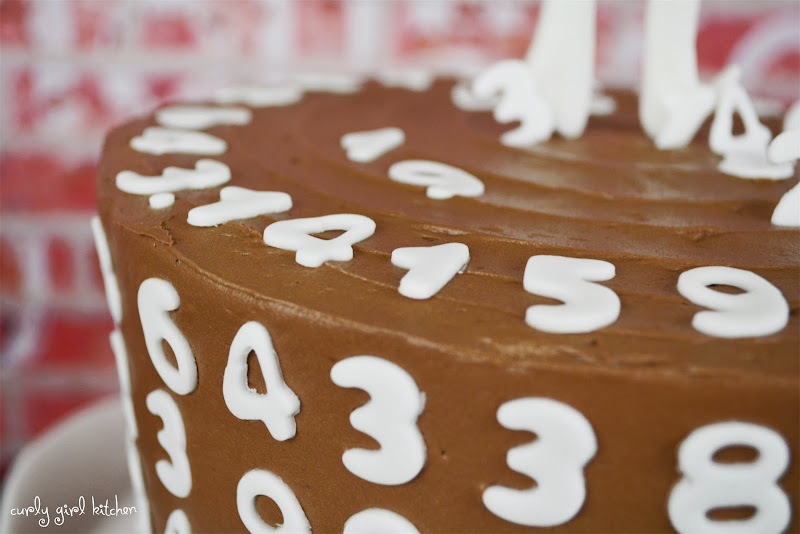 And although I used fondant for a clean, crisp look, you could just as easily pipe the numbers with buttercream. Chocolate tends to get overlooked so often when it comes to making "pretty" cakes, simply because it it can't be any color other than brown. 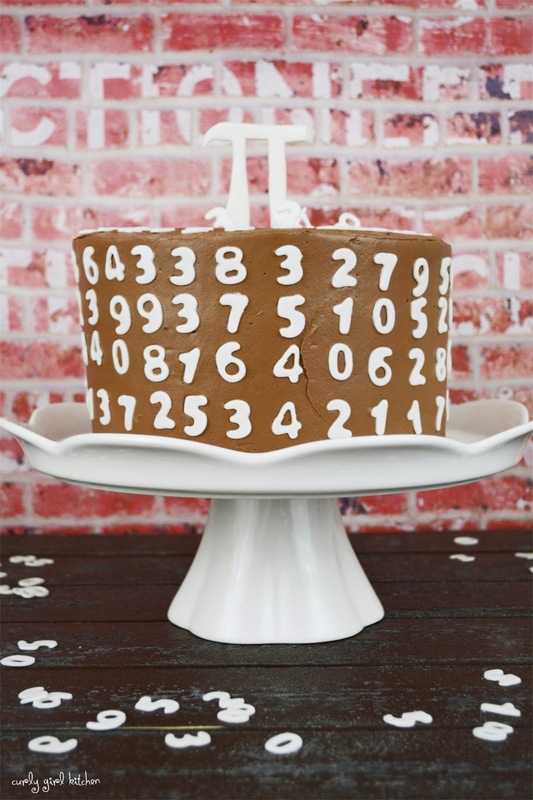 But I love chocolate buttercream, and I thought all the white numbers would look really pretty against the milky brown chocolate. 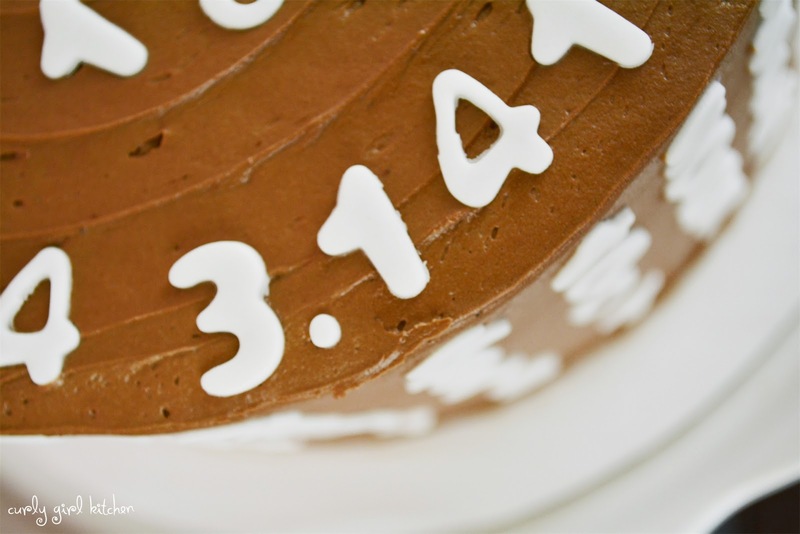 If you inspect the cake carefully, you can see where I started with 3.14, then began circling around the cake from top to bottom. At first, I left a little gap to show where each line started and stopped, and then I decided I didn't like how the gap looked, so I filled it in with more numbers, which, of course, made the whole thing far less accurate. But whatever. 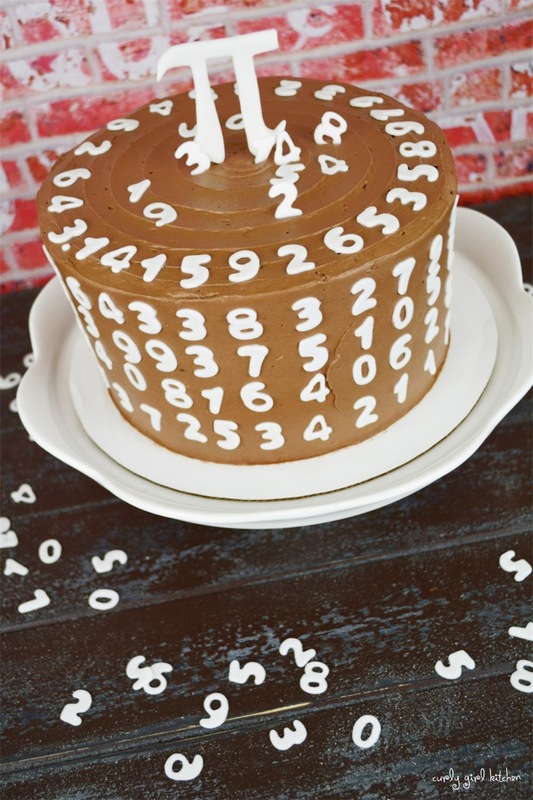 I especially like the numbers scattered over the top, like they just jumped right out of the equation and landed on a chocolate cloud of cake.